One of the best parts of writing a film blog is that literally every post, I learn something new - sometimes it's something I have sketchy details about that's made clearer. Sometimes it's just realizing that a director I thought I was unfamiliar with, actually made a movie I liked from back in the day. And other times, I'm totally getting schooled. 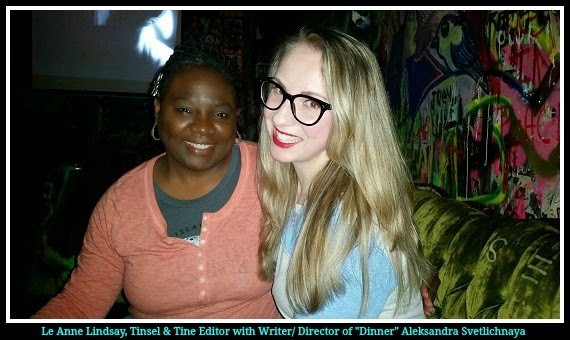 For instance, Cosplay, this is a term I was unfamiliar with till I attended the Philly preview screening of writer/director Aleksandra Svetlichnaya's short film DINNER. Ukraine born, Philly bred, Aleksandra is a multi-talented young woman, who not only has written and directed her own film, but she's a black belt in karate, a fashion designer, actress and natural producer. 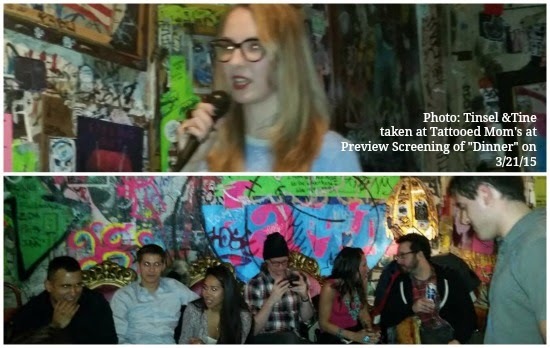 She emailed me and asked if I'd come attend the screening of her short Dinner at Tattooed Mom's last month. I have to say, normally this would be something I'd put on the Philly Calendar, but probably not attend; that personal request however, went a long way. Since Dinner's run time is less than 30 minutes, I won't go into too much detail as not to spoil it, but basically it could be described as "Buffy The Vampire Slayer" meets "Twilight"; only no one wants to be on this vampire or this werewolf's team, cause they're idiots. Intentionally so, they are rival Cosplayers on their way to a VIP event, both angry that the other received an invite. Upon their arrival they find their hosts to be less than hospitable and extremely hungry. Cosplay - the practice of dressing up as a character from a movie, book, or video game. I sat down for a quick interview with Alekesandra after the screening. Like many actresses, she got tired of waiting for the right roles to come along, so she decided to write and direct her own. T&T: Have you always wanted to direct as well as act? AS: It was something I naturally knew that I wanted to do one day, but I just thought it would be further down the line. But then one day, I just got tired of saying "one day". Honestly, I'm such a planner and I normally plan everything far in advance, but this project was such an organic process. It seemed to have a life of its own. T&T: but for your first film, it seems kind of ambitious to direct yourself doing your own stunts too. AS: I'm not big on doing little things. If I say I'm going to do it, I have to do everything. But I do enjoy working with a team, and I know how to lead a team, because I have a vision, and I know what I'm going for. Ricardo Segarra, Kyle Harter, Nick Chianese. T&T: How did you assemble your team? 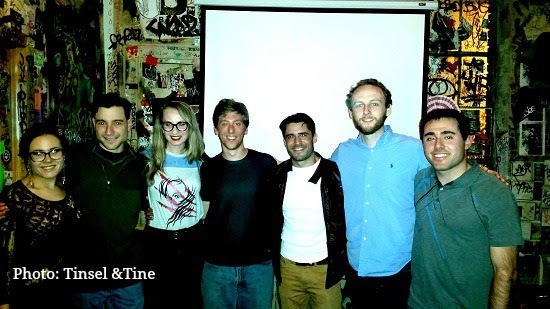 AS: The Werewolf, Ricardo Segarra and I were cast in a commercial together in 2013 and stayed in touch through facebook. He's a former wrestler, so I knew he'd be interested in something like this. So Ricky was the first one I brought onto the film. All the other actors, were either someone knew someone, or I found them through our casting call. I couldn't imagine anybody else playing any of the parts. Everyone was perfect! AS: Kyle [Harter] responded to one of my ads looking for an editor. I looked at his reel... I'm very big on going on feelings and intuition. I can usually get a feeling or vibe about a person, whether I meet them in person or even via email or phone, so every person that I brought on, I had a very good positive feeling about, and everybody volunteered their time. This project had like no budget, in fact, we had negative budget. T&T: But the makeup is very good. How did you afford that? AS: That was done by Shawn Sieger. His background is in scary horror makeup. He was incredible. He works at The Bates Motel and Haunted Hayride, but we met on another independent project, and again, stayed in touch via social media - social media is awesome. He loved the script and he just thought it would be fun.... Honestly, the thing that I wanted the most out of this project was that everyone involved in it walk away saying - "That was awesome, that was fun, I'm so happy I did it". I think that's what happened and that's my greatest reward. If nothing else ever comes from this, I feel like I already won. Aleksandra Svetlichnaya strikes me as a very determined young woman, I have a feeling a lot more will come of this, and we'll all be learning how to pronounce her last name very soon. Production credits: Aleksandra Svetlichnaya - "Dylan", Director, Writer, Executive Producer | Irina Kravchenko - Beauty Hair & Make Up Artist Associate Creature MUA | Joshua Kachnycz - "Oscar" & Stunt/Fight Coordinator | Ricardo Segarra - "Hamilton" | Geremy Webne-Behrman - "Zombie" | Kyle Harter - Editor | Nick Chianese - Music Composer, "Dinner Score" and Effects.